Every ounce of my creative energy is being sucked into my new novel, which is probably the hardest thing I've ever written. New genre, multiple POV characters, major world-building....but great fun. So to keep from horribly neglecting the blog, I'll be featuring some fabulous weekly author interviews and giveaways over the next month with Dana Bate, Dina Silver, Brenda Janowitz, Samantha Stroh-Bailey, and more. Stay tuned, y'all! Laurie Notaro's latest, The Potty Mouth at the Table. We just saw World War Z, and I was pleasantly surprised! A smart take on the zombie genre. Anything and everything eighties on Spotify. Yesterday I made a pan of homemade granola bars: Melt 1/2 cup agave syrup that the elderly bagger made fun of me for buying, 1/4 cup brown rice syrup, 1/4 cup brown sugar, and 1/2 cup coconut oil in a small saucepan on the stove. Pour it over the following, which you've dumped in a large bowl: 2 cups oatmeal, 1 cup Rice Crispies, 1/3 cup chocolate chips, 1/2 cup coconut shreds, 1/3 cup dried cranberries, 1/3 cup pepitas, 1/4 cup ground flaxseed, 1/4 cup hulled hemp seed, and 1/4 cup chia seeds. Mix well. (It was kind of a hodgepodge of everything I had in the cupboard.) Press into a 9x12 greased Pyrex pan, bake at 350 degrees for 15 minutes, and cut into bars when cool. Try not to inhale them all in one sitting. "Come on guys, it's time o'clock!" And, about Daisy: "Him so cute!" We're also on Week Two of our CSA pick-ups--strawberries, kohlrabi, sugar snap peas, lettuce, asparagus, potatoes ... and I've got to cut this blog short because J wants to drag me down to South Park to a car show. Which, as you all know, I'm hugely into. Let's keep this party rolling with another author interview and giveaway! 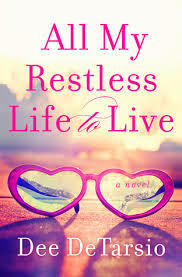 I am so happy to welcome the lovely Dee DeTarsio to the blog today, to help celebrate the recent launch of her latest novel, All My Restless Life to Live (isn't that a fabulous title?) 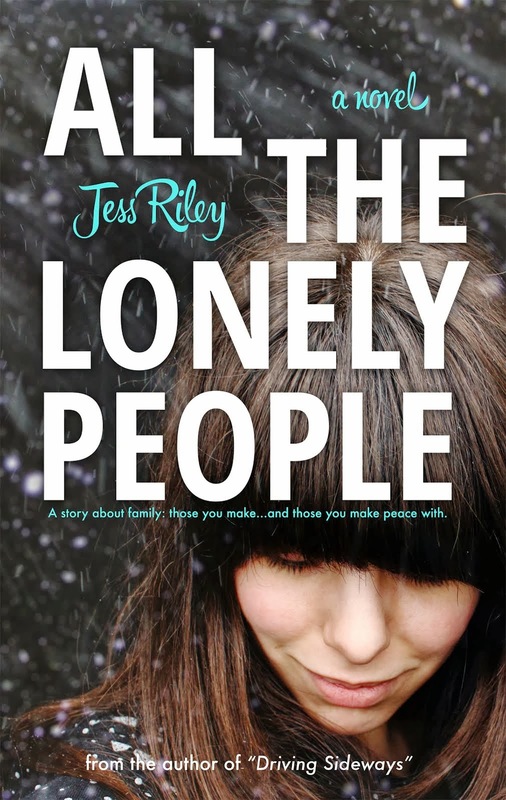 I "met" Dee online when she contacted me after reading All the Lonely People--turns out she's a fellow Midwesterner, and she's damn funny, with a huge heart to boot. (Did I actually just type "to boot?" 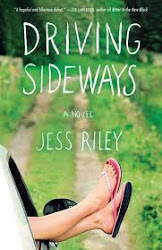 Moving on...) Leave a comment below and you'll be entered to win a signed paperback copy of her new novel!! Life is a soap opera, especially for Elle Miller, who writes for one. (Ellen dropped the "n" in her name in hopes of finding a better ending for herself.) When her laptop crashes, she borrows her recently deceased dad's computer and gets way more than she bargained for. Elle unravels mysterious communications from his computer, while her mom decides to give Internet dating a try. As Elle tries to save her career at I'd Rather Be Loved with a storyline featuring a trip through Atlantis, she takes a trip to the Emmys, and finds herself in the middle of a romance between a real doctor and a hunk who just plays one on TV. Friends, family, and clues from "the other side" all help Elle figure out the difference between living the good life and living a good life. Fans of Marian Keyes and Jennifer Weiner will delight in Dee DeTarsio's sparkling prose and lively dialogue as she takes readers into the heart of women's lives. Filled with friendship, love, loss, betrayal, and challenges that force her characters to find their place in the universe, Dee's novels give us that hopefully-ever-after we're searching for. 1) Tell us about All my Restless Life to Live. (GREAT title, by the way!) Where did you get the idea? 2) What do you find most challenging about the writing life, and how do you address it? 3) What teenage memory makes you cringe? “What happened?” She wanted to know. And in that moment, when the universe decided, Nope, still not humble enough, I realized she wasn’t referring to the incident in my white Jordache jeans. 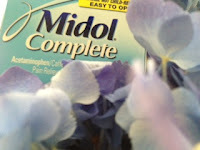 There wasn’t enough Midol in the world. 4) Writing humor is tough, but you make it look effortless. What's your secret? 5) If you could have any super power, what would it be? I wish my super power was the ability to get by on four hours of sleep. Who are those freaks of nature and how can I become one? I am all about the recommended eight hours, and occasionally experiment with nine! Thanks, Dee! Okay guys, leave a comment below to win a signed copy of All My Restless Life to Live, telling us whether or not you watched soap operas growing up, and if so, which one(s)? Don't forget your email address! You have until midnight on Friday, June 28 to enter. DEE DeTARSIO is a TV writer living in southern California. After growing up in Ennui, Ohio, and graduating from The Ohio State University she vowed never to be cold again (in a tantrum more worthy of Suellen than Scarlett) and ended up in Tucson, Arizona, producing the news for the CBS affiliate, oddly enough called KOLD-TV. She moved to San Diego where she worked in the SeaWorld entertainment department as a producer/writer. (Penguins are mean!) She then became a producer/writer for the NBC affiliate. 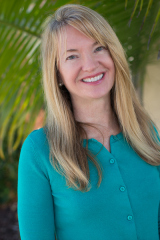 Dee is the author of hopefully-ever-after novels: THE SCENT OF JADE, THE KITCHEN SHRINK (both finalists in the prestigious San Diego Book and Writing Awards), 'TIL SOMEBODY LOVES YOU, ROS, and HAOLE WOOD, 2013 Next Generation Indie Book Awards Finalist! Her new book is ALL MY RESTLESS LIFE TO LIVE. Though her mother never beat her (that hard) and her father is not a celebrity, she suspects one of her four sisters is a vampire. 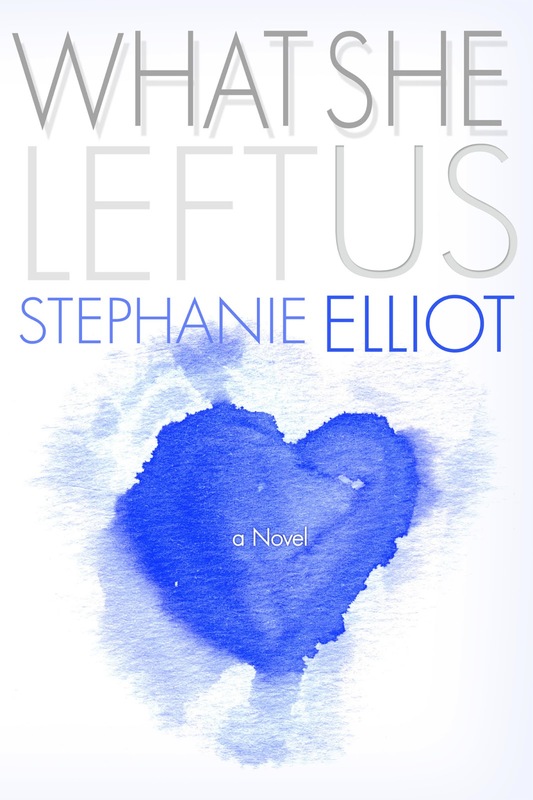 Today on the blog I am super-excited to welcome Stephanie Elliott, one of my best friends, writer or otherwise, to celebrate the recent release of her debut indie novel, What She Left Us: a tender, insightful story about the relationships between mothers and daughters and sisters. We've got redemption, forgiveness, family secrets, and hot guys to fall in love with: what more do you need?! Jenna and Courtney are dealing with the unexpected death of their mother in different ways. Jenna broke off her engagement to the man she thought she'd love forever, while Courtney headed back to college to take charge of a dorm-floor full of college students as a resident assistant. 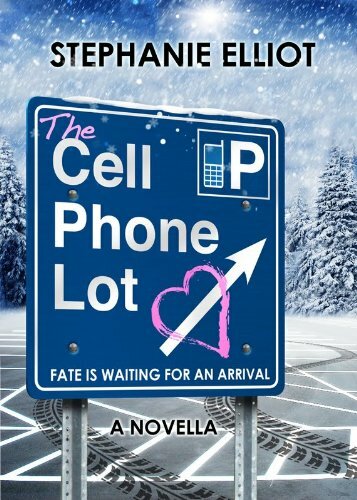 Steph (of the popular blog "Booking with Manic") has got THREE copies of her novella The Cell Phone Lot to give away to three lucky commenters with e-readers. Don't forget to leave your email with your comment! I'll randomly pick a winner on Saturday. 1. Where did you get the idea for What She Left Us? The idea for What She Left Us actually came to me after I read Gwendolen Gross' The Orphan Sister, which is about two identical twin sisters and the third odd sister. It made me wonder about the dynamics of sisters and what it would be like to grow up as individual 'only' childs... like if one child were 10 years old and then another child came into the family some way, some how later in life, and how the family would turn out. (My sister and I are Irish twins, the same age for two weeks out of the year, so it was interesting for me to think about two sisters kind of far apart in age as young children.) That was the original idea, and the original title was The Only Other Child, but the story turned into something so much more than that after that first idea. 2. What songs are on the What She Left Us playlist? This one is easy because these are the songs that played in the background at the bar, Klippy's, and the songs that Mitch played on his guitar. Totally random. Florence and the Machine's "Dog Days Are Over"
3. What teenage memory STILL makes you cringe? OK, I was 16 and babysitting my 5-year-old brother. My mom was working and my boyfriend was over. (For the record, my sister and other brother were home and I probably told THEM to watch him while I was 'busy!) It was summer and probably around 11 a.m. My boyfriend and I were fooling around in my bedroom, with the door locked, or so I thought. Yeah, that happened... my little brother walked in on us and found me in a compromising position. We weren't doing everything, but I was not wearing anything on top. Ugh, cringing right now at the memory. It gets worse. He's 5 years old. Do I bribe him forever and have to live the rest of my life doing what he says to keep him from telling Mom. Oh yeah, it happens to be Mom's birthday. I decide I have to tell my mom what happens before my brother tells her or he makes my life a living hell. So, 16-year-old me tells my mom, ON HER BIRTHDAY, what my little brother caught me doing. Mortifying. 4. What do you feel are the components to a fabulous book? Characters, plot, suspense. First things that came to my mind. What are yours? 5. What super power would you wish for? A couple -- Read faster, write faster, and have stretchy arms so when I'm sitting at the table I could grab anything I wanted without having to get up. Thanks, Steph!!! I laughed out loud at the stretchy arms. Don't forget to include your email address when you comment--tell us what super power YOU'D wish for! Why not. You have until Saturday to enter--three copies of The Cell Phone Lot up for grabs, so you've got good odds!! 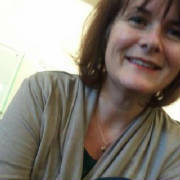 Find Steph on Twitter and Facebook. I am married to a very funny guy whose humor is delightfully subtle. He’s incredibly laid-back, nonchalant, sweet, and unassuming, and then BAM—he’s delivered the perfect, understated one-liner that has me gasping for breath. Much of his humor is incredibly inappropriate. For example, while watching The Voice, I’ve averaged three “You’re terrible!” comments per episode in response to his twisted jokes and observations. A strong case can be made that I’m just as terrible, but we balance one another here; two terrible people in the household at the same time is too much. I have managed to recreate most of the 1,500 words lost in the new novel when my flash drive died last week, though something about the *new* version still bugs me. My garden is waterlogged but mostly happy, and I'll do a photo diary soon. I have been downsized at work, but there are many silver linings--we'll be tightening our belts, but I'll have more time to write ... hopefully the new material doesn't revolve around double coupon shopping trips or a taste-test of ALDI wines or cat food. 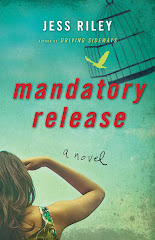 We are now 33 days from the release of Mandatory Release. I can tell because my insomnia and nervous pukey feelings have been increasing daily. If you'd like to help me celebrate launch day on Tuesday July 16, I'll be doing an event at Becket's Restaurant in Oshkosh for the Winnebago Literacy Council's. Reading, chat, and book sales from 5-7; tickets are $25 and include snicker-snacks. All proceeds go to support the literacy council. Now Presenting: Amy Sue Nathan! 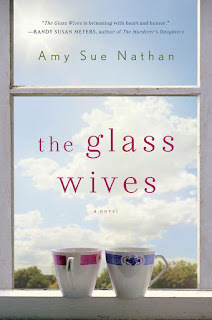 Today on the blog I'm so thrilled to be hosting Amy Sue Nathan, debut author of a fabulous new novel, The Glass Wives (St. Martin's). Amy started the popular Women's Fiction Writers blog two years ago, and it's a wonderful place to find interviews with some of the best voices in the genre today. 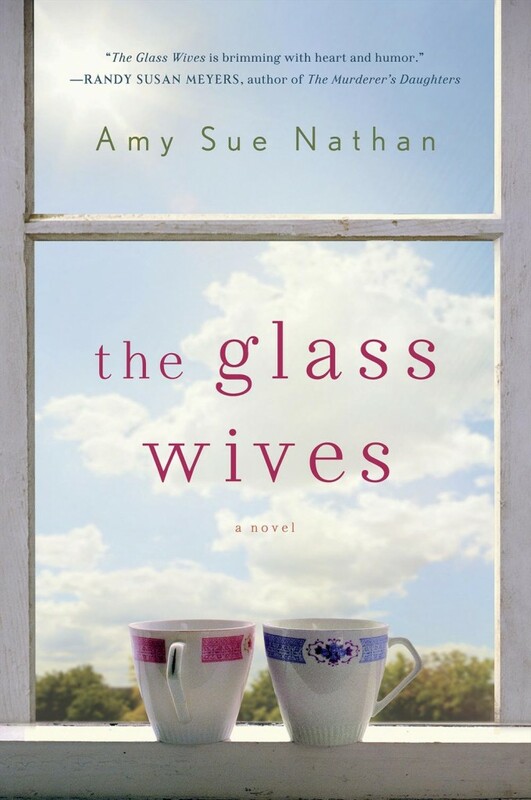 Amy is a kind, generous, and talented person, and she's giving away a signed copy of The Glass Wives to one lucky reader--just leave a comment below to enter! 1) What inspired you to write The Glass Wives? My life! In the novel, the main character is a divorced mom whose ex-husband dies leaving her with two kids and a mortgage and a big mess. That happened to me in 2004. But, I turned the truth inside out and upside down to write fiction because I wouldn't write about my real life kids or our real hardships. It was fun to write with "what if" in mind. 2) Who are some of your author idols? Judy Blume, Margaret Atwood, Alice Hoffman. But really my idols are the authors around me who are talented and generous who I'm proud to call my friends. I wore a lot of blue and pink eye shadow. I had very long nails and very tight jeans. Oh c'mon. It was the early 80s and it was awesome. 4) What advice do you have for aspiring authors? Don't give up. You can't have a book published if you don't write it, rewrite it, rewrite it again, polish it, and put it out there for others to critique. 5) You’ve been asked to bring a dish to a summer potluck. What’s your Go-To Recipe? Now that's when I cringe! The best thing anyone ever brought to one of my backyard barbecues was a bag of ice cream novelties for dessert. I thought it was so clever! And it was so much fun to just pass around the bag and let everyone pick their own treat. If I had to cook and it was summer, I like feta, watermelon, and mint (or basil) on skewers. Thanks, Amy! (I too LOVE Judy Blume, Margaret Atwood, and Alice Hoffman...) Don't forget to leave a comment that includes your email address* below to win a SIGNED COPY!!! Tell us YOUR Go-To summer potluck recipe. You have until midnight EST, Friday June 7 to enter. *Don't worry, I won't spam you, but I do need to get a hold of you if you win! UPDATE: Contest closed. Congratulations Jess Bair!